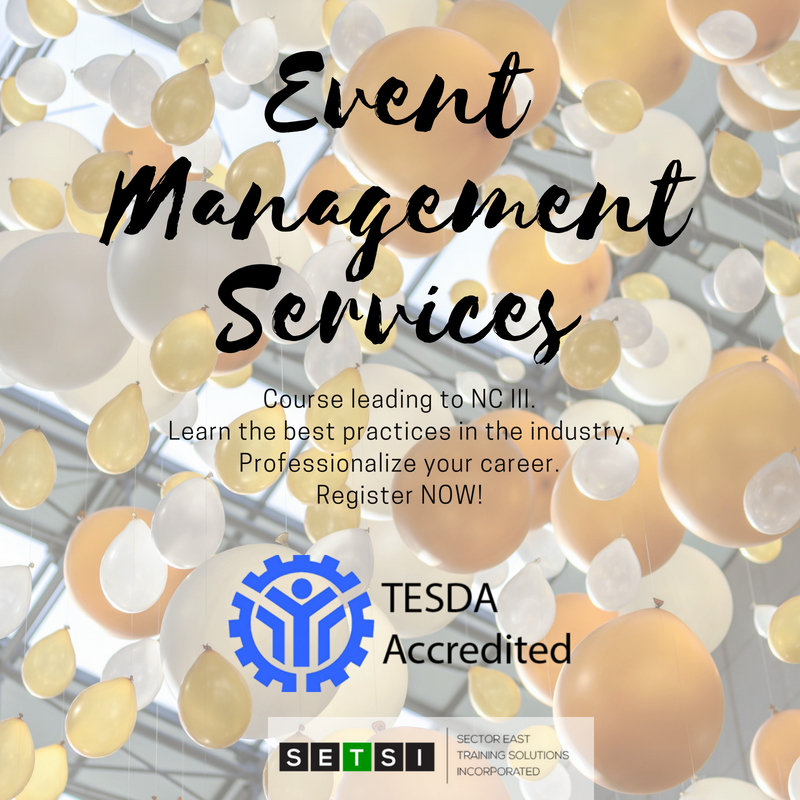 Sector East Training Solutions Inc. (SETSI) is a Technical Vocational Institution accredited by TESDA to offer TVET Programs for Event Management Services NC III. Our school is located at Sta. Elena, Markina City. What is Event Management Services? Event management involves creating and developing large-scale events which may include conferences, conventions, concerts, trade shows, festivals, and ceremonies. Event management involves identifying the target audience, formulating the event concept, planning the overall logistics of the event and conducting project management of the event as a whole -- including managing the teams of people responsible for each function, the budget, and overseeing the execution of the event. Event managers also supervise the services of all outside vendors and professionals, which includes event planners. Sector East Training Solutions Inc. (SETSI) is offering a TVET Program for Bookkeeping NC III. - Apply the principles of marketing to the process of event production. - Assess the viability of an event during the early stages of planning. - Identify strategies used to raise funds and generate event revenue. - Apply techniques to manage the financial resources of an event. - Coordinate the logistical and operational details of an event. - Appreciate the potential social, economic, and environmental impacts of events. - Identify and plan for potential risks inherent in an event. - Evaluate the success of an event. You can explore careers in an events company or form your own.